Have you ever wished you could stay downtown San Francisco and enjoy all this exciting city has to offer, but then be whisked away for a decadent day in one of the most celebrated and beautiful winemaking regions in the word? Take this indulgent journey where you don’t have to worry about how to get there, where to eat, or what to do. This tour has the best of Napa and Sonoma Valleys covered. Tasting fees on the Group Wine Tour are not included. Gratuity is not included for your chauffeurs or on the Wine Train. We meet you where you are and take you to the place we love. 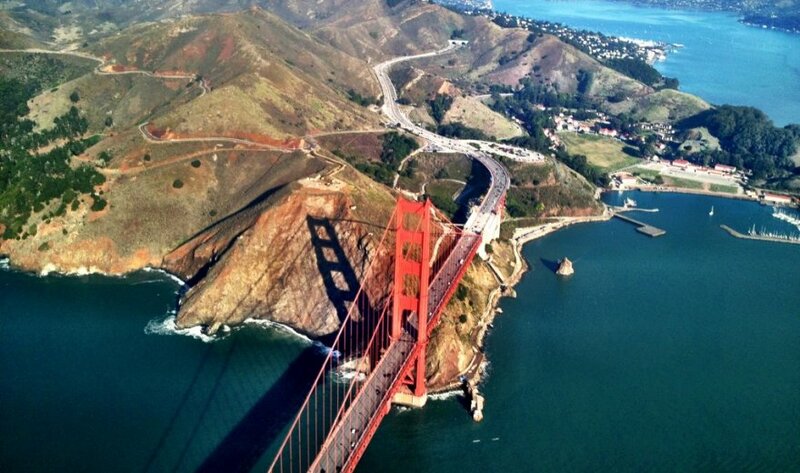 Your journey from San Francisco starts off on the right foot—continental breakfast on board your limo bus and picture-perfect views of the Golden Gate Bridge from stunning Vista Point. Then relax as we take you to from one iconic place to the next: Napa and Sonoma Valleys. We set the bar high with our first stop. The name is the same, but after just one sip at Jacuzzi Family Vineyards, and the name Jacuzzi will no longer conjure images of spas and hot tubs. You might instead remember sipping their flagship wine, Valeriano. The breathtaking winery with an old-world feel and sweeping vineyard views offers more than just wine. When your taste buds need a break from wine tasting (does that ever happen? ), it’s time to sample some The Olive Press’s award-winning olive oils. Choose from a selection of infused, uniquely flavored, and dipping olive oils to enjoy. The remaining three winery tours are Chauffeur’s Choice. Given their extensive knowledge of Wine Country, you’re in very good hands. In between the tastings and the tourings, a beautiful drive through the Carneros, a wine-growing region and sub-appellation tucked in between the Napa and Sonoma Valleys, in fact, overlapping them. The Napa-Sonoma area in general is blessed with an extraordinary landscape, but Carneros in particular is a beauty, with its gently rolling hills and sweeping flat plains. Carneros, meaning sheep in Spanish, was known for the many sheep ranches dotting the hillside, and you’re very likely to see lots of them roaming around the countryside. Today the region is home to thousands of acres of vineyards and more than 20 wineries, many of which feel more European than Californian, noted for producing fine Pinot Noir, Chardonnay, and sparkling wines. After your fourth and final winery, it’s off to Downtown Napa. Stroll and shop the Oxbow Public Market, then check in at the Wine Train Station and get ready for your extraordinary culinary adventure through the stunning Napa Valley landscape. After your elegant train journey, getting back to your San Francisco hotel is as easy as sitting back, relaxing, and leaving the driving to us. Pickup at one of three convenient central locations in San Francisco. Upon boarding our Limo Bus, you will enjoy a continental breakfast on your drive through the city. Travel north crossing the very awe-inspiring Golden Gate Bridge to our first stop, the Vista Point at the Golden Gate Bridge. Snap some postcard-worthy photos of the celebrated landmark, and re-board the vehicle where you are welcomed back with mimosas. Wine and olive oil tasting at Jacuzzi and The Olive Press and if time permits, a visit to the picturesque Sonoma Town Plaza. Based on their extensive Wine Country knowledge, your chauffeur will guide you to their choice for the second winery of the day. A beautiful drive through the Carneros region will bring us to our third winery of the day. After your production tour and tasting throughout the winery, we will present a lavish buffet picnic lunch by the vineyards. Your chauffeur will guide you to their preferred Napa winery for the fourth tasting of the day. Enjoy an hour to relax and shop before you walk one block to the Napa Valley Wine Train Station, where you can check in and browse the Wine Train’s extensive Wine Shop. Board the Dinner Train for your multi-course gourmet dinner through spectacular Napa Valley. Limo bus takes you back to San Francisco, where a private sedan will drop you off at your hotel. The package price may not be available on specific days, like holidays. The Napa Valley Wine Train uses responsible beverage service. If a guest is visibly intoxicated upon arrival at the Wine Train Station, our staff reserves the right to refuse alcohol service or even deny the guest a trip on the Wine Train entirely.